The German Hunting Terrier is an active, athletic, focused, hardworking, tenacious, lively and hardy dog. He can be a challenging pet because he is bred to work and to hunt. He is no lapdog, but with attention, patience and training can become a wonderful family companion. If given enough exercise he can nap and relax in the house and be left alone for periods of time. He needs a great deal of activity and exercise to satisfy his instincts, however, and must have a purpose in life and tasks to perform. He loves to work, is eager to please you and is readily trainable, but you must be firm, confident and consistent to train him. He needs obedience training early on so that he can learn to behave properly in the house. He is a high-energy dog who needs long walks or jogs or opportunities to hunt and track prey. Once outside the house or the yard, he transforms into a determined hunting maniac! He loves to swim and retrieve, and will retrieve anything he can carry. He never gives up. He has a powerful nose and is skilled at scent work. He loves active games, like hide-and-seek-the-toy. When he's not hunting or performing a task, he must be leased, in the house, kenneled or securely fenced. He is not a dog who can be left alone in a yard. He is naturally aggressive toward other animals, and will try to get at them. He can be aggressive toward other dogs and cats, although he can learn to get along with family pets if he is raised with them as a puppy. He makes a good watchdog because he is alert, territorial and watchful, and usually only barks for a reason. He can be sociable with other people, but quite often is devoted to one person only, and in this case does not welcome approaches from anyone who is not his owner. You should be cautious with him around children, although in some cases he can be an excellent and affectionate companion for responsible young people. He is a big-hearted, outgoing dog who is loving with the right socialization and focused care. He practically doesn't shed, and so would be a good pet if you are concerned about dog-hair in the home. 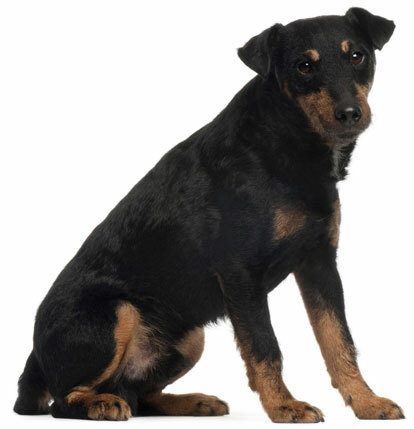 The German Hunting Terrier is 13 to 16 inches tall (to shoulders) and weighs 16 to 22 pounds. He has a short coat that can be wiry or smooth. His coat color is black, gray or brown, with brown, reddish-tan, or white markings. He only needs an occasional brushing. The German Hunting Terrier, known in his home country as the "Jagdterrier," is a very new breed of dog. He was developed in the Bavarian region of Germany around the turn of the 20th century as a hunter of wild boar, fox, badger and weasel. He is descended from older terrier breeds like the Fox Terrier and the Tan Wire Terrier. The first German Hunting Terrier Club was formed in Germany in 1926; the first "Jagdterriers" began to arrive in Canada and America in the 1950's, and have been used as "tree dogs" to hunt squirrels. The breed was recognized by the United Kennel Club (England) in 1993, but he is as yet a relatively rare and under-utilized hunting dog outside Europe.